Wrapping an oval cabochon or cameo is a technique Dale “Cougar” Armstrong has become well-known for; it’s a technique she teaches in classes across the country in person, and now she’s ready to teach you this fine technique in the comfort of your own home! All you’ll need is wire, jewelry pliers, tape, markers, and a ruler to execute this timeless design – oh, and of course, a cabochon or cameo! 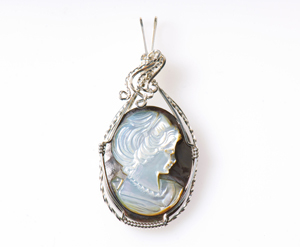 In Lesson 4, you’ll wrap a 22 x 30mm cabochon of your choosing in the beautiful pendant frame. This foundational technique will give you the basis for wrapping all kinds of stones in wire, including wrapped pendants, bracelets, and more. In this class, Dale “Cougar” Armstrong will give you accurate measurements to wrap a cabochon or cameo tightly in wire for a beautiful, elegant look. Plus, you’ll learn more bail techniques, building on the bail formed in Lesson 3. 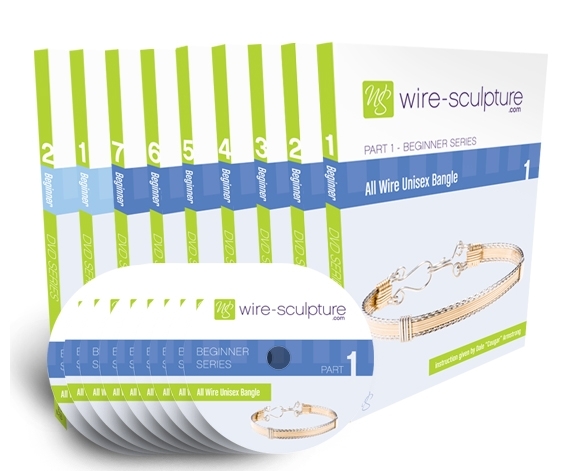 This technique is something every wire jewelry artist should know – start learning today! Though I am not new to wire wrapping this basic lesson covers every aspect of each technique. As an ambidexterous wrapper I have had problems deciding in which direction to turn either my piece or my tool… this beautifully clear photography cleared up a few problems I have been having (for years!). Thank you so much for taking the time to slowly demonstrate each technique! Now I will be able to finish my bails on each of my pieces with the flair they deserve! I now understand why taking each lesson in sequential order allows one to build one technique upon the other!!!! A lightbulb moment for me! I really enjoyed this one. I was amazed to see that even thin things can be done. I have some paula shell and won’t be afraid to play now. I even ordered the heart angels for some earrings to try out. Love this. Fun huh Marilyn – with a mandrel you have all types of sizes at your finger tips with just one item (I am also guilty of having lots of ‘found’ items or junk that I keep – just in case). I am fairly new to wire wrapping & have successfully wrapped a few thicker (on the sides) cabochons, but could not get the thinner ovals such as 25 x 18 to work for me. The inner 2 wires would not stay around the stone. This video lesson was so excellent. It addressed the problems I was having. Now I just have to watch the lesson a few more times, then set up my laptop & supplies at my work table and try one out! Hi Deb, I am so glad that this simple lesson has helped you so much! !